Today’s purebred Siamese bear little resemblance to the first cats that arrived in the West in the late 1800’s from Thailand (previously Siam). Siamese have gradually evolved through artificial selection to look like the cats we know today. 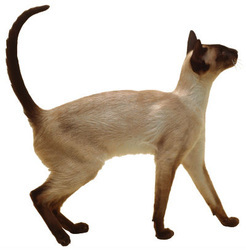 The typical modern Siamese is a well-balanced cat with head and neck carried on a long, svelte body supported on fine legs and with a long, whippy tail. The head is wedge-shaped, long and broad with large ears set well apart. Their oriental-shaped eyes are perhaps their most striking feature, the blue colour varying in depth across the range of points colours. Siamese are not large cats so bodies are meant to be medium in size, long and muscular. When they walk it is with an almost panther-like movement. Their coats are short, fine and close-lying. 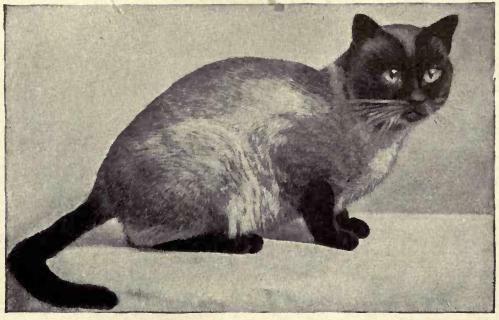 The first Siamese to be seen in Europe were Seal Points, which are genetically black cats with a colour-restricting gene which limits colour to the extremeties i.e. tail, legs, paws, ears and face. 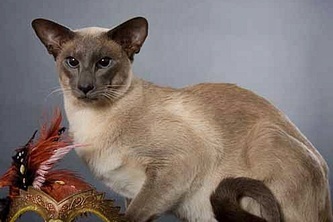 Today there are a large variety of colours and patterns, some having appeared naturally in the early days and others being created by crossing Siamese mainly to domestic shorthair cats. In contrast to these modern Siamese, there are the traditional Siamese, also known as Appleheads. 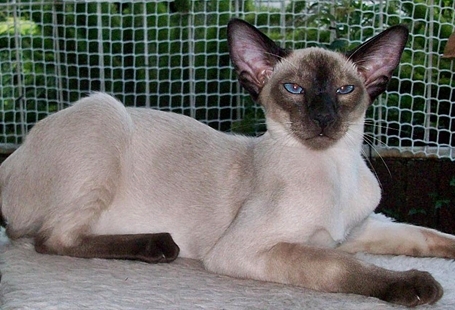 These are being bred by traditionalists in the USA in an attempt to recreate and retain the “old fashioned” early Siamese. 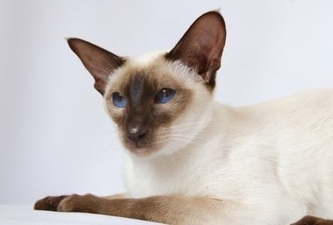 Siamese are regarded as one of the oldest breeds of domestic cat and these breeders aim to preserve the breed much as it existed when originally imported from Siam with their muscular, athletic though stockier build, round head and eyes and smallish ears. 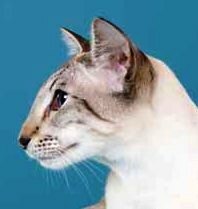 Squints and kinked tails, regarded as serious faults in the modern Siamese, still tend to crop up fairly regularly in the Appleheads. Local breeders sometimes receive enquiries for the “old fashioned” Siamese but by breeding to the Breed Standard these are not seen. The best that one can hope for is that the “ugly duckling” kitten in a pedigreed litter has a more rounded head, rounder eyes and smaller ears than it’s littermates. The Siamese cat is a well-balanced animal with head, ears and neck carried on a long svelte body, supported on fine legs and feet and with a tail in proportion. The head - frontal view and profile - is wedge-shaped, neither round nor sharp. Alert and intelligent expression. HEAD Wedge-shaped, long and well proportioned, carried on an elegant neck, with good width between the ears, narrowing in straight lines to a fine muzzle. The wedge starts at the tip of the nose and flares out in straight lines to the tips of the ears, forming an equilateral triangle.The skull is slightly rounded. Straight profile and strong chin. EARS Large and pricked, wide at base, set so as to continue the lines of the wedge. EYES Oriental eye shape, pointed at inner and outer corners. Set well apart and slanting towards the nose. Eye size medium, neither protruding nor recessed. BODY Medium in size, long, svelte and elegant. TAIL Long, tapering and whip-like. COAT Short and fine in texture, glossy and close lying. Protruding lower end of sternum. Lack of contrast between body and points. Heavily marked body, e.g. spots or bars. Incorrect colour on nose leather or pads. 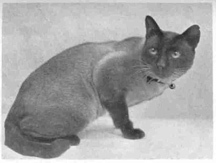 Heavy ringing on tail (for solid colour Siamese). Any defects as listed under the Relevant to All Breeds Section. Very weak chin and uneven bite. Fixed squint in one or both eyes. Eyes tinged green, or green rimmed. Seal Point (Sia05Pt) - Body cream, shading gradually to pale warm fawn on back and flanks. Points clearly defined dense seal brown. Faults Any cold shade of black or grey in body or points shall be considered a fault. Nose leather and pads Seal brown. Blue Point (Sia06Pt) - Body glacial white, shading if any to be the same cold tone as the points, but of a lighter colour. Points light to medium blue. 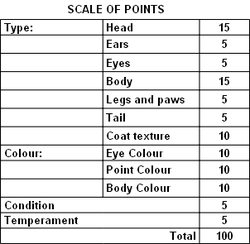 Faults Cream, fawn or self blue body colour shall be considered a fault. Withhold major award for pink nose leather or pads. Nose leather and pads blue. Chocolate Point (Sia07Pt) - Body ivory, shading, if any, to be the same tone as the points, but of a lighter colour. Points milk chocolate. Legs paler than the other points should not be too heavily penalised. Nose leather and pads Chocolate or cinnamon pink. Lilac Point (Sia08Pt) - Body off-white (magnolia), shading if any to tone with the points. Points pinkish grey. Nose leather and pads pinkish grey or faded lilac. Cinnamon Point (Sia09Pt) - Body ivory, shading if any to tone with the points. Points warm cinnamon brown. Legs may be slightly paler than the other points. Faults Cold points or body colour shall be considered a fault. Nose leather and pads pink to cinnamon brown. Fawn Point (Sia10Pt) - Body off-white (magnolia), shading if any to tone with the points. Points warm pale rosy mushroom. Legs may be slightly paler that the other points. Nose leather and pads pinkish fawn. Caramel Point (Sia11Pt) - Body off-white (magnolia). Shading if any to tone with the points. Points brownish blue (blue-based) or warm brown-tinged lilac (lilac/fawn-based), matching on all points although the legs may be slightly paler in tone than the other points.Legs and feet may be paler in tone. Nose leather and pads brownish purple (blue-based) or pinkish grey (lilac/fawn-based). Red Point (Sia12Pt) - Body off-white. Shading if any to apricot on the back and flanks. Points reddish gold; legs and feet slightly paler in colour. Barring on mask, legs and tail is permissible. Freckles may appear on nose, lips, eyelids, ears and pads. Slight freckling in a mature adult should not be penalised. Nose leather and pads deep pink. Cream Point (Sia13Pt) - Body off -white. Shading if any to cream to match points. Points cream. Legs and feet slightly paler in colour. Barring on mask, legs and tail is permissible. Freckles may appear on nose, lips, eyelids, ears and pads. Slight freckling in a mature adult should not be penalised. Nose leather and pads pink. Apricot Point (Sia14Pt) - Body off-white. Shading if any to tone with the points. Points hot cream with a soft metallic sheen. The legs and feet may be slightly paler than the other points. Barring on mask, legs and tail is permissible. Freckles may appear on nose, lips, eyelids, ears and pads. Slight freckling in a mature adult should not be penalised. Nose leather and pads pink. Seal Tortie Point (Sia15Pt) - Body cream, as clear as possible; tortoiseshell shading if any to tone with points. Points seal brown, patched or mingled at random with red, varying shades permitted. Any large areas of red may show some barring. Nose leather and pads seal broan and/or pink. Blue Tortie Point (Sia16Pt) - Body glacial white, as clear as possible; tortoiseshell shading if any to tone with points. Points blue, patched or mingled at random with cream, varying shades permitted. Any large areas of cream may show some barring. Nose leather and pads blue and/or pink. Chocolate Tortie Point (Sia17Pt) - Body ivory, as clear as possible; tortoiseshell shading if any to tone with points. Points milk chocolate, patched or mingled at random with red, varying shades permitted. Any large areas of red may show some barring. Nose leather and pads chocolate or cinnamon pink and/or pink. Lilac Tortie Point (Sia18Pt) - Body off-white (magnolia), as clear as possible; tortoiseshell shading if any to tone with points. Points pinkish grey patched or mingled at random with cream, varying shades permitted. Any large areas of cream may show some barring. Nose leather and pads pinkish grey or faded lilac and/or pink. 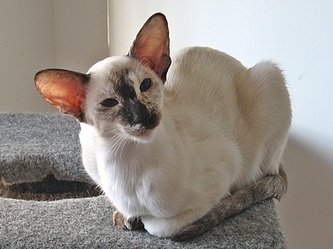 Cinnamon Tortie Point (Sia19Pt) - Body ivory, as clear as possible; tortoiseshell shading if any to tone with points. Points warm cinnamon brown, patched or mingled at random with red, varying shades permitted. Any large areas of red may show some barring. Nose leather and pads pink to cinnamon brown and/or pink. Fawn Tortoiseshell Point (Sia20Pt) - Body off-white (magnolia), as clear as possible; tortoiseshell shading if any to tone with points. Points warm pale rosy mushroom, patched or mingled at random with cream, varying shades permitted. Any large areas of cream may show some barring. Nose leather and pads pinkish fawn and/or pink. Caramel Tortie Point (Sia21Pt) - Body off-white (magnolia), as clear as possible; tortoiseshell shading if any to tone with points. Points brownish blue (blue-based) or warm brown-tinged lilac (lilac/fawn-based), patched or mingled at random with apricot, varying shades permitted. Any large areas of apricot may show some barring. Nose leather and pads brownish purple (blue-based) or pinkish grey (lilac/fawn-based) and/or pink fawn and/or pink. Seal Tabby Point (Sia05Tp) - Body cream, as clear as possible; tabby shading, if any, to tone with points. Points clear seal brown tabby markings. Nose leather seal brown or brick red outlined in seal brown. Eye rims and pads seal brown. 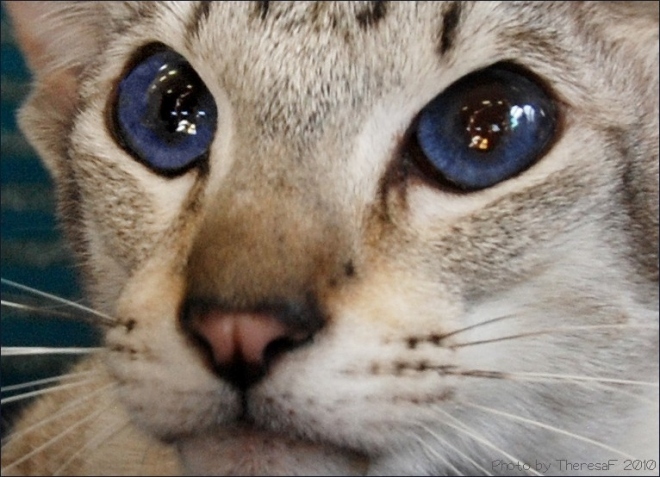 Blue Tabby Point (Sia06Tp) - Body glacial white, as clear as possible; tabby shading, if any, to tone with points. Points clear blue tabby markings. Thumbprints may be less apparent. Nose leather blue or pink outlined in blue. Eye rims and pads blue. Chocolate Tabby Point (Sia07Tp) - Body ivory, as clear as possible; tabby shading, if any, to tone with points. Points clear milk chocolate tabby markings. Nose leather chocolate or cinnamon pink or brick red outlined in chocolate or cinnamon pink. Eye rims and pads chocolate or cinnamon pink. Lilac Tabby Point (Sia08Tp) - Body off-white (magnolia), as clear as possible; tabby shading, if any, to tone with points. Points clear pinkish grey tabby markings. Thumbprints may be less apparent. Nose leather pinkish grey or faded lilac or pink outlined in pinkish grey or faded lilac. Eye rims and pads pinkish grey or faded lilac. Cinnamon Tabby Point (Sia09Tp) - Body ivory, as clear as possible; tabby shading, if any, to tone with points. Points clear warm cinnamon brown tabby markings. Nose leather pink to cinnamon brown or pink outlined in cinnamon brown. Eye rims and pads pink to cinnamon brown. Fawn Tabby Point (Sia10Tp) - Body off-white (magnolia), as clear as possible; tabby shading, if any, to tone with points. Points clear warm pale rosy mushroom tabby markings. Nose leather pinkish fawn or pink outlined in pinkish fawn. Eye rims and pads pinkish fawn. Caramel Tabby Point (Sia11Tp) - Body off-white (magnolia), as clear as possible; tabby shading, if any, to tone with points. Points clear distinct brownish blue (blue-based) or warm brown-tinged lilac (lilac/fawn-based) tabby markings. Nose leather Brownish purple or pink rimmed with brownish purple (blue-based), and pinkish grey or pink rimmed with pinkish grey (lilac/fawn-based). Eye rims and pads brownish purple (blue-based) or pinkish grey (lilac/fawn-based). Red Tabby Point (Sia12Tp) - Body off-white, as clear as possible; tabby shading, if any, to tone with points. Points clear reddish gold tabby markings. Nose leather, eye rims and pads deep pink. Cream Tabby Point (Sia13Tp) - Body off -white; tabby shading, if any to cream to match points. Points clear cream tabby markings. Thumbprints may be less apparent. Nose leather, eye rims and pads pink. Apricot Tabby Point (Sia14Tp) - Body off-white, as clear as possible; tabby shading, if any, to tone with points. Points clear hot cream with a soft metallic sheen tabby markings. Thumbprints may be less apparent. Nose leather, eye rims and pads pink. Other colours include Tortie Tabby Point. Silver Tabby Point, Silver Tortoiseshell Tabby Point, Smoke Point & Tortoiseshell Smoke Point are recognised as Oriental in South Africa. When deciding to acquire a cat or kitten it is necessary to choose a breed which is best suited to your situation and environment. You may like the look of a certain breed but are you cut out to live with it's personality? Never purchase a kitten for a child unless you want it yourself as well. Never rush into the purchase of a companion that will have the freedom of your home for up to 15 years. 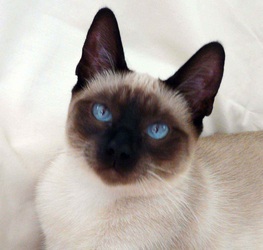 Siamese are not necessarily a breed for those wishing for a quiet, independant cat. They need things to do and people and animal companionship and their personalities are as dependant on the understanding and interest shown by their owners as on it's pedigreed lines. 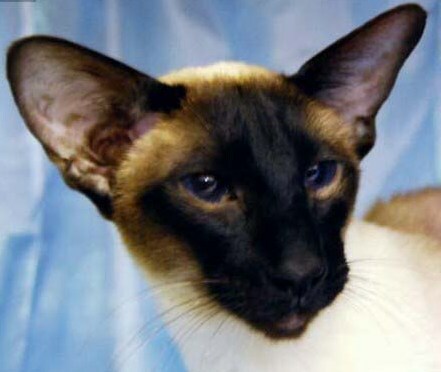 This being said, Siamese cats make wonderful pets. They have a larger-than-life quality, having perhaps a bit more of an affectionate and sociable nature than other cat breeds. They seem to have endless energy to burn and love to play games. 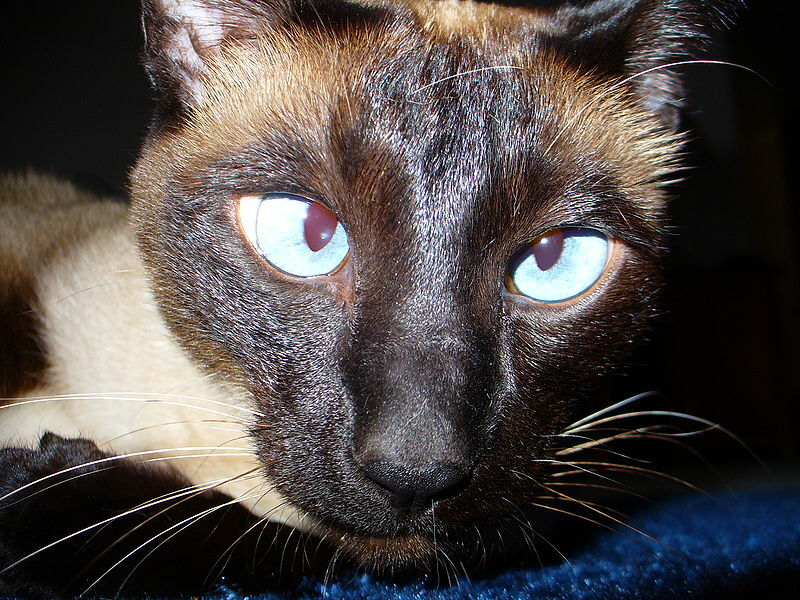 Siamese will often show a particular attachment to the human of their choice, following him around, showing delight when he returns and jumping onto his lap when he sits down and onto his bed at night. Siamese are said to be the most talkative of feline breeds and a devoted owner will soon learn what is being communicated to him. Should you have your heart set on a Siamese kitten find a reputable breeder or two, visit their homes and see kittens in their home surroundings while still with their mothers. Do not necessarily take the first kitten you see. Try and see a number of litters if possible. Watch out for runny eyes and sneezing or for kittens that appear unwell. Make certain that the seller knows what your intentions are regarding the kitten, if registered for breeding, show kitten etc. The two most important points when looking for a kitten, especially if it is meant solely as a pet, are that it is healthy and has an affectionate nature. Siamese, with their short, close-lying coats, require little actual grooming. Your cat will manage with being brushed once or twice weekly as, with all the petting and stroking it demands, it's coat will need very little extra care. Most Siamese love to be groomed, which removes any debris or loose hair thereby preventing excess dead hair from being deposited on furniture. This also prevents the development of hairballs. However, grooming of the coat is only part of taking care of your Siamese. Ears should be checked and cleaned when necessary with a dampened cotton bud, but never probe deep into the ear. Keeping the ears clean should protect against ear mites. One of the first signs that will tell you your cat is unwell is the condition of it's eyes. In a healthy Siamese these should be clear, bright and sparkling. Should dust or a little "sleep" accumulate in the corner of the eyes, this can be gently wiped away with damp cotton wool. The mouth and teeth should also be checked from time to time for tartar build-up which can lead to infection. 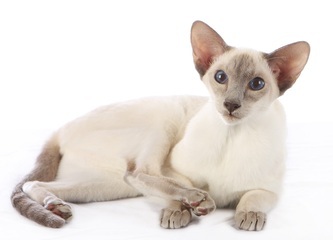 Your Siamese should receive a complete and balanced diet and preferably requires high quality foods which contain a larger percentage of protein. Although dry foods are now very popular and easy to feed you should ensure that your Siamese is also given wet foods.